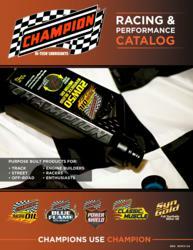 Champion Oil, a recognized leader in development and manufacturing of top-tier synthetic lubricants, announced today that the updated 2013 Champion Oil Performance & Racing Catalog is now available online. Champion Oil Announces Online Download of 2013 Performance and Racing Catalog. Champion catalogs are free and available in print upon request or can also be viewed online or downloaded in Adobe® PDF format at http://www.championsusechampion.com/catalog.